The Tall ship races are a rare maritime spectacle - not only do they involve grand sailing galleons from the golden age of sail but also crews comprised of young sailor cadets. Every year tall ships’ races take place in European waters in the name of promoting ‘international friendship’ and providing hands-on sail training for young mariners. These races have become such celebrated spectator occasions because the boats taking part are often magnificent traditional sailing craft, whose designs hark back to a golden era when sails ruled the waves. The beautiful parade of vessels can include top sail schooners, brigantines, brigs and barques in their number. 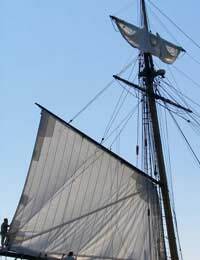 However, entry is not the exclusive preserve of glamorous sailing ships - the term ‘tall ships’ has been coined especially to describe any large, traditionally rigged sailing vessel. If you can boast a monohull sailing ship over 9.14m in waterline length, a crew membership at least 50 percent of between the ages of 15 and 25 years old and you meet the Sail Training International’s safety standards then you can race! With such a defiantly retro foundation, it is easy to dismiss tall ship racing simply as a crowd pleasing nostalgia show for a lost and redundant age. However, although first conceived in the mid-20th century as way of bidding farewell era of great sailing ships, the tall ship races quickly evolved into heralding something new - a new dawn in sailing and sail training. The public interest in the first race in 1956, from Torquay to Lisbon, was so enthusiastic that the organisers founded the non-profit organisation Sail Training International to adopt the races as a means educating young people through the enriching experience of sailing. Subsequent years saw young souls of all nationalities, races, cultures and social stratas take part in their sail training programme. The charity organisation has since been renamed the Tall Ships Youth Trust, whilst a subsidiary group called Sail Training International has taken responsibility of the racing organisation. The main tall ships’ race is an annual summer race series that takes place in European waters and involves two racing stages of several hundred nautical miles. The young mariners that make up at least 50% of the crew complete the voyage as of the sail training programme. The route of the race series changes every year and typically takes in a number of European ports. In recent years, one race started in Liverpool, took in Måløy and Bergen in Norway before finishing in Dan Helder in the Netherlands, and another began in Gydnia, Poland and took in Russia, Finland and Lithuania en route. Each of these annual events involves between 70 and 100 vessels from between 15 and 20 countries. The young crew members taking part can number as many as 6,000. As a break away from the racing, they take part in a variety of activities in each of the ports on the way. 2009 saw the first ever transatlantic tall ships race. The course began in Vigo, Spain, and in order to reach the final destination of Belfast, competitors needed to first pass through Bermuda, Charlestown, Boston, and Halifax in Canada across the Atlantic. The success of the European races has led to the foundation of sail training organisations all around the world, as well as the creation of other races, training voyages, events, and even festivals for sail training tall ships. Many of the races are organised or endorsed by Sail Training International. Beyond European waters, an irregular tall ships race that takes place around the north Atlantic, in addition to the annual ‘Tall Ships Challenge’ series, the location of which alternates between the Great Lakes, the Pacific Ocean and North America’s Atlantic coast. Races have also been staged in the seawaters around Japan and Korea.